Based on journal entries, a Danish survey team probably sighted musk deer while working in the remote regions of northeast Afghanistan in 1948, but that was the last official sighting—until now. A new survey team led by members of the Wildlife Conservation Society (WCS) recorded the species still alive, but endangered.1 Seven similar species found throughout Asia eat vegetation, so why do they need tusks? Musk deer do not grow antlers, but males do grow fangs. They live secluded lives, preferring remote and rocky environments far from man. If they could observe the animals more often, the researchers could undoubtedly learn more about how the deer live, including how they use their long tusks, but the small deer are experts at avoiding detection. A 2011 survey of the same area was unable to verify the deer were still alive, despite the use of DNA forensic protocols and remote motion-triggered cameras. The recent WCS surveyors recorded their few sightings while the deer were alerted to their presence. Nevertheless, enough is known about musk deer to note that the bucks use their characteristic tusks to tussle when competing for mates. For all we know, they may also use their tusks in display communications as well. 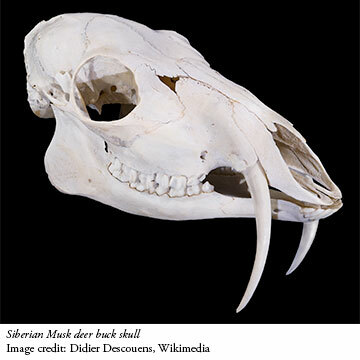 In other words, not every animal bearing fangs uses them for harmful predation.3 From a creation perspective, the lifestyles of male musk deer illustrate some of the originally good purposes He may have had in mind when God created the DNA instructions to build tusks. Ostrowski, S. et al. Musk deer Moschus cupreus persist in the eastern forests of Afghanistan. Oryx. Published online October 22, 2014. Criswell, D. 2009. Predation Did Not Come from Evolution. Acts & Facts. 38 (3): 9. The same is true of fruit bats. See Thomas, B. Why God Created Large, Sharp Teeth. Creation Science Update. Posted on icr.org March 26, 2012, accessed November 4, 2014.